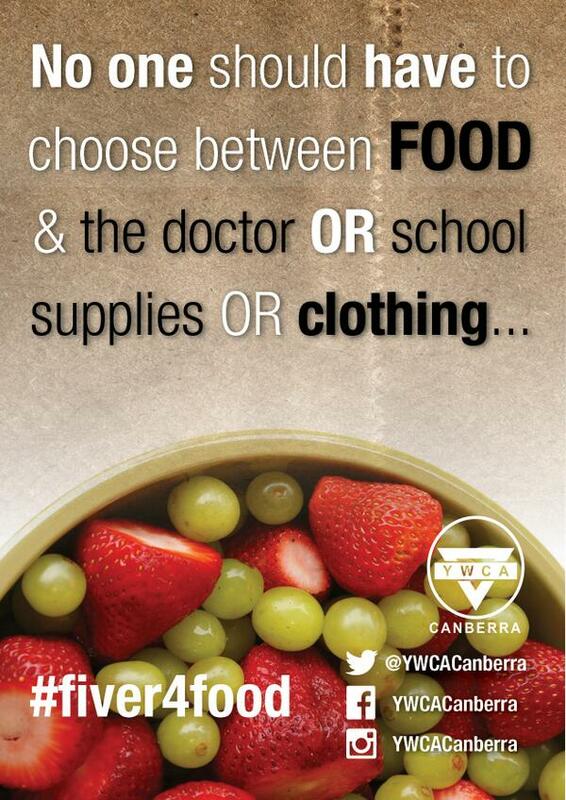 On Friday night I attended the finale $5 potluck of the YWCA Canberra’s winter food hub appeal. And I was honoured to discover that I was gifted a wonderful gourmet hamper hand-selected by Natasha Rudra, the Food and Wine Editor at The Canberra Times. I was keen to support this appeal. As a die-hard frugalista, I have first-hand experience of crafting family meals that are nutritious and filling but cost next to nothing. In our case, frugality is mostly a life choice. We have investment properties, so if we are in-between tenants or there are big bills to pay like rates or land tax, the budget can be quite tight. This can be stressful, but I have learnt to find ways cheap shortcuts to manage. But not everyone has a choice. Although an OECD report recently singled out Canberra as having the highest levels of well-being in Australia, some people move to Canberra in search of elusive jobs, leave (or would like to leave) abusive relationships, or just can’t make ends or afford the high rent market. And winter in Canberra is a cold place when you don’t have a Fireside Festival to enjoy. On Friday night, I had a lovely chat with Karan Gabriel from YWCA Canberra. She said that a large part of the YWCA’s campaign is not just providing food, but also advice on how to cook ingredients cheaply. Many of their clients are used to eating convenience and processed food, which is no wonder given how prevalent it is on supermarket shelves, television advertisements, magazines and everyday life. We went shopping as a family on Saturday and Big A wanted to buy almost everything that was unhealthy and/or had cute pictures on it. Karan told me that the YWCA’s food hub is also quite personal for her. Not that long again, she was a single mother of two. She found creative ways to stretch her food budget. For example, instead of buying a barbecue chicken, she found it was cheaper to buy a frozen one, defrost it and bake it herself. She would divide it into three, using some for meals and others for sandwich fillings. Then she would use the carcass to make a soup, which would be the basis for a risotto meal. I can so relate to this, as I don’t think I have ever thrown out a barbecue chicken without making it into soup. In fact, I don’t throw much out if I can help it. 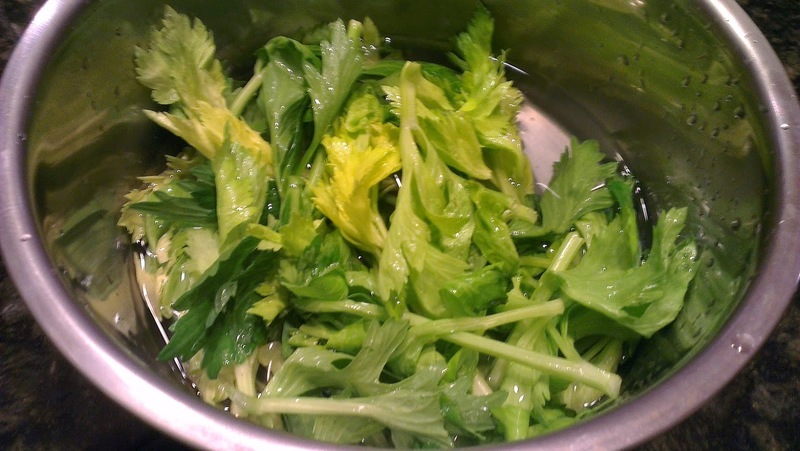 And here, I share a recipe using celery leaves. The thing I like about this combination is that it shows that you don’t have to sacrifice good nutrition if you are on a budget. Some superfoods are cheap or can even be free! I was about to throw out the celery leaves into the compost bin, but I couldn’t bear to waste such healthy looking greenery. I googled celery leaves, and found that they are high in Vitamin A, anti-oxidants and therefore have anti-cancer properties. So I threw them into a quick meal that made a healthy lunch for me for two days. It smelt heavenly when I reheated my lunchbox in the work microwave oven. And I loved the slight crunch that the celery tops gave this dish. Best of all, it was cheap and reused an ingredient that would otherwise have been thrown out. This recipe is inspired in part by macrobiotic cooking, which utilizes brown rice as a staple because of its health benefits. But substitute white rice if you would prefer. Turmeric also has healing properties, and lemon is good for boosting your immune system (essential in winter). 1. In a fry pan (I used a cast iron fry pan), add a splash of olive oil and then the chopped garlic, onion and the chopped lemon peel. 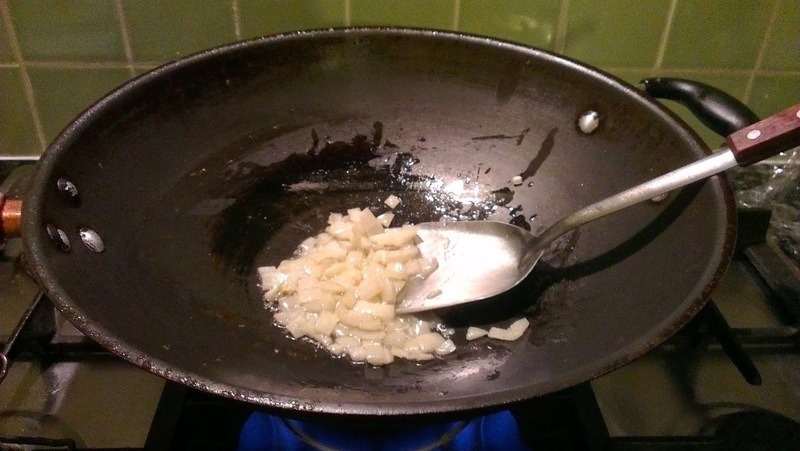 Cook gently until the garlic starts to smell wonderful, but is not yet browned, and the onion is transluscent. Add the turmeric and cook for a few more minutes. 2. Add the brown rice, and toss through the oil and spices to coat. Add a bit more oil if you feel necessary. 3. 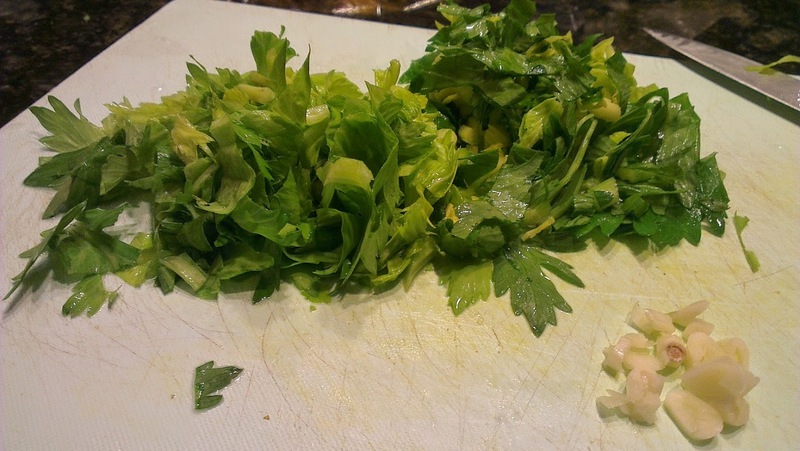 Stir in the celery leaves, and leave them for a few minutes to wilt into the rice. 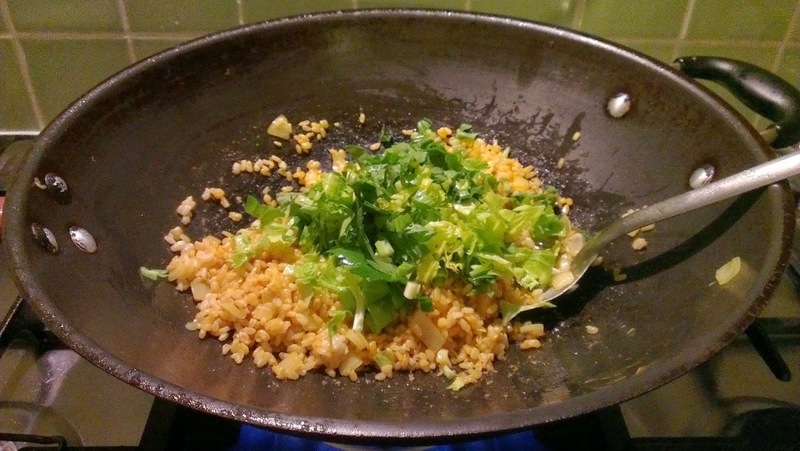 If your fry-pan has a lid, you can add it to create a kind of steam effect. .
4. Open the tin of tuna, and flake the contents. Using a fork, stir the tuna through the rice mixture. 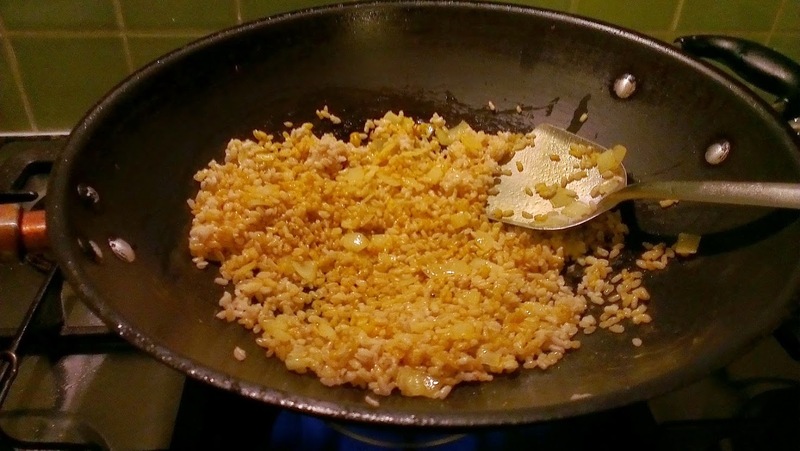 Sprinkle over the lemon juice, and continue to cook – stirring gently – for a few minutes minutes. 5. 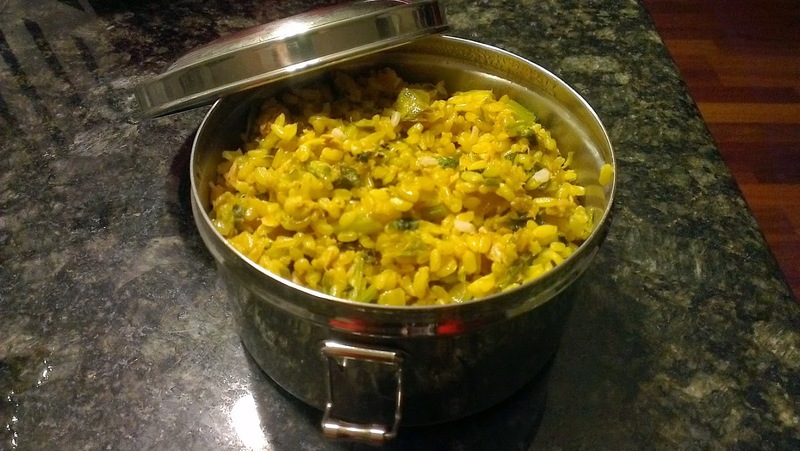 Serve at once, or spoon into containers and serve for lunch the next day. Great recipe! I love using celery tops in soups, stews, risotto, mince recipes etc. To think, using everything was the norm only a few generations ago and now we are just so wasteful. Yes, a lot of things get thrown out these days that are still edible and can be reused. I think it is mainly lack of awareness, and also lifestyles being so busy. Glad you also use celery tops — great antioxidant.